Rinse the mushrooms of any dirt or grit. Heat the butter in a cast iron skillet over medium. Once it starts to bubble, add the garlic; bloom for 30 seconds. Add the Marsala wine and bring back to a bubble. 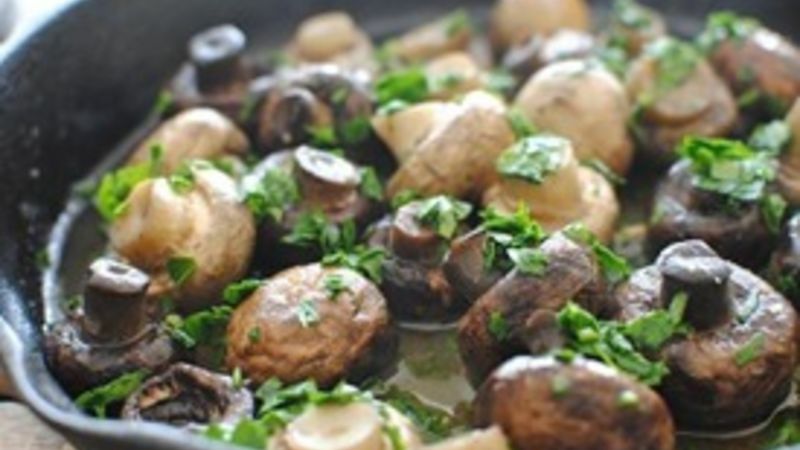 Toss in the mushrooms, cover and simmer on medium-low heat for 15 minutes. Remove the lid, throw in a pinch of salt and simmer 5 more minutes. Sprinkle with fresh parsley and lemon juice. Serve right out of the cast iron skillet, or on mini appetizer plates! Remember when we were vacationing together in Spain last month? And we were at that crazy cool tapas restaurant? And everyone was knee-deep in sangria and spoon-feeding each other everything from succulent bites of olives and mushrooms to questionable chunks of fried and stuffed something or others? Remember how much fun we had?! REMEMBER? Oh, that was just in my head? Well, I have an idea. Let's make some tapas-style sautéed mushrooms and PRETEND that we're in Spain, at a crazy cool restaurant, listening to the duo belting away in the corner, knee-deep in sangria and spoon-feeding each other these GA-LORIOUS buttery, winey, garlicky, lemony, parsley-y bites of paradise, m'kay? Actually, we should just toothpick-feed ourselves. We don't want to look like fungus freaks. All right, so grab some great baby bella and white button mushrooms. And some beautiful fresh parsley. Melt some butter in a cast iron skillet. This makes my eyeballs so happy. Once it starts to bubble, add the garlic and wine. Bloom 30 seconds. Then toss in the star of the show. My nose is now happy. Cover and simmer, simmer. Look at that. Spritz with lemon and sprinkle with parsley. Oh, my my my. The awesome thing is, you can serve these babies on the table, right out of the skillet. Or, serve them up on cutesy little plates. *Bev loves the fact that sautéing mushrooms in butter, garlic and wine can still put her on the euphoria highway, without ending up in prison. For more musings, visit her blog at Bev Cooks and her Tablespoon profile.